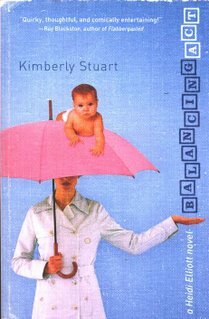 Today, I have mom-lit author Kimberly Stuart! With her baby on one side and her career on the other, what’s a girl to do? As maternity leave comes to an end for Heidi Elliott so does virtually everything she thought she knew. The substitute filling in for her high school Spanish classes has made a complete mess—not just with her students, but perhaps in way far more personal. Her husband has made a habit of going out of his way to help a beautiful, wealthy, thin client and to further complicate things, an old boyfriend has moved back to the neighborhood. Fiercely independent, Heidi has never been one for group activities, much less church chats and teas. Pushed into accepting an invitation to the Wednesday night Mom’s Group, she finds herself in a sea of polyester, polka dots, big hair and, surprisingly, strong women, who just might hold the lifeline she didn’t think she needed. I like my marriage. I love my husband, he loves me, we coexist peacefully. My husband is a good man. He laughs at my jokes and buys me pedicures. He changes the raunchiest of diapers. He still finds me sexually attractive after birthing two children, or at least is smart enough to lie about it. But Marc does have one serious flaw that is contaminating our Eden: He can’t understand his wife’s fixation with books. Marc: Are you going to be reading for a long time? Marc: Like, for how many more minutes? Marc: Wanna go ______ (for a walk? to the mall? to the world table tennis championships?)? Kim remains silent in hopes that Marc will pick up woodworking. It isn’t that Marc is opposed to reading. He has two advanced degrees and has put in his time before the written word. This might very well be the reason for his aversion. For so long, reading was a means to an end, whereas for me, reading is the end. Bookstores and libraries beckon to me when I should be engaging in more practical activities like grocery shopping or memorizing the Bill of Rights. A roaring fire in the fireplace has little to do with listening to jazz or engaging in quiet conversation over a hot toddy, but it has everything to do with the new Barbara Kingsolver or another indulgent dip into Nick Hornby. The same is true for airport delays, road trips, waiting rooms, porch swings, dog walking and subway rides. He still chuckles about Owen Meany and his squeaky voice. He has gifted numerous copies of the Enger book to all the males in our family, I suppose with the assumption that there’s a chromosomal aspect to its literary power. And he’s like a bulldog in social settings, working the room like Don Ho as he does PR for his wife and her writing. “What a splendid idea!” I’ll cry, letting him draw me into a heart-stopping embrace before jumping onto the couch, under a shared blanket, and into our books, gleeful on our shortcut back to Eden. Wish I could say the same for my S.O. He has yet to read a single book in the 9 (almost 10) years I’ve known him. Isn’t that sad? He’s currently trying to slog through my manuscript (yeah, the one that sold and is bringing in income to the family coffers).